Whenever I bake those buttery Bakery biscuits, hubby dear keeps asking for a different version to be made. I can’t escape baking a batch of chocolate biscuits, so for the next batch, I decided to make them using the Cashew Almond powder we always stock. It’s very fine powder but soft to touch. It’s not exactly dry as it’s refrigerated. Though they say Almond meal is basically the fine almond nuts ground to fine powder, I can’t say as I haven’t touched it myself. These cookies tasted very nice with it’s nutty texture. To deck it up, I pressed in broken cashews on top. It was funny how all of them fell off after being baked. Now that’s going to be another lesson to learn on how the branded biscuits have their nuts stuck on the top. These were really those melt in your mouth types with the nuts adding a great taste. 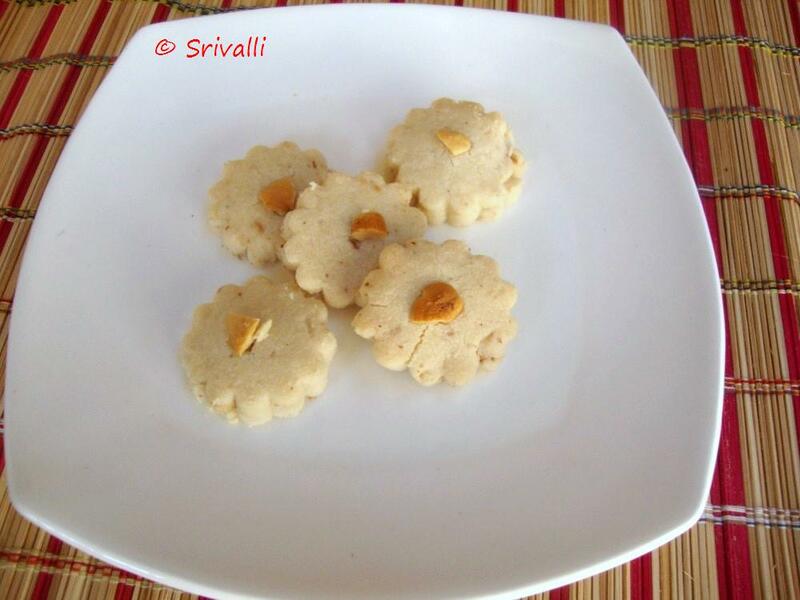 Refer The Basic Biscuit Recipe for detailed step by step recipe. In a measuring cup, fill half cup with Cashew Almond powder, fill the rest of the cup with flour. Transfer the flour to a bowl, add icing sugar vanilla essence and mix. Melt Vanaspati for a minute in Microwave and slowly mix in to bowl. This needs to be done with small quantity and you need to keep rubbing it to get that crumble texture. Keep kneading the dough and continue till you get a dough that is soft yet stays in shape. Pinch out small balls and press between your palms to form a small circles. Else you can also make balls and roll them to the thickness you prefer and cut with a biscuit cutter. Since I have those cute flower cutters, I used them. You need not grease the tray as the biscuits will let out oil during the baking process. Once you have placed all the biscuits on the tray and the timer on the pre heat goes out, place the tray inside the oven and bake for 15 minutes. After 15 minutes, you can let it rest for few minutes inside the oven. Remove, allow the biscuits to cool before storing it in an air tight container. Notes: Some thought that one needs to add water/milk, it is not required. The vanaspati is enough to get the cookies going. Come next week you will see the buzz happening daily, be ready for the next BM to begin! Wow they look perfect and yummy. Those cookies looks damn pretty and addictive..
they look cute and delectable!…just like the store bought ones! tried & failed… the amount of sugger mentioned can not be right… it all started melting away within few min & i was left with a surgery slab. Dheeraj Sorry the cookies didn't turn out well. Do let me know if you tried the recipe exactly as mentioned. It turns out perfectly each time I make this. So I am surprised you say the cookies melted away. Which mode did you use?